From Otago Daily Times: In 1974, the name Aragorn Peak appeared on a Fiordland topographic map published by the Department of Lands and Survey, but by 1980 the mountain had been stripped of the name. The New Zealand Geographic Board has decided to keep the mountainous area Tolkien-free after declining a proposal to name a nearby peak Tolkien Mountain. Manapouri man Aaron Nicholson had applied to have an unnamed 1757m peak at the northern end of the Earl Mountains in Fiordland National Park, named Tolkien Mountain but the New Zealand Geographic Board has declined the application. 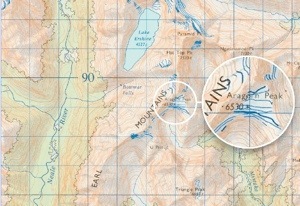 New Zealand Geographic Board secretary Wendy Shaw said the board’s naming policy had not been met and it was not convinced the peak needed a name. ”The proposal would have had to have provided a strong association between the person being honoured/commemorated, and the area where the feature is located.